Find hotel near St. Andrew's Basilica Art .. Located in Arthunkal, this basilica is attributed to the Portuguese missionaries of the 16th century. A major pilgrim centre located right on the beach, it is known for its miraculous healing properties. A serene place to be, it brightens up even more during the Perunnal festival. 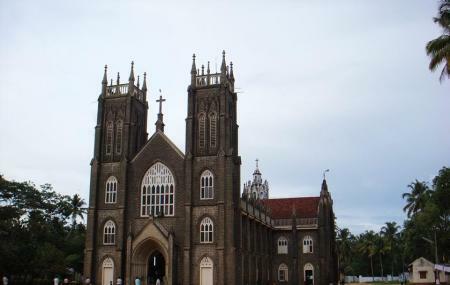 How popular is St. Andrew's Basilica Arthunkal? People normally club together Kanichukulangara Devi Temple and Marari Beach while planning their visit to St. Andrew's Basilica Arthunkal. There are two parts to this church, the old and the new (although the new also pretty old); it faces seaward and the besides this thoughtful design, the architecture is also great! Tall walls reflecting grandeur in every niche; there’re a number of statue illustrations lined outside describing various scenes from the Bible; it’s beautiful indeed! A famous pilgrim centre in the coastal region between alappuzha and Cherthala. The festive season begins in January. This church situated 200 meters near the sea. This is an ancient church built by the British while the period of their reign in India. People go to this place on foot as a worship to saint Sebastian.Usually People from many places come here even in the off season. Amazed at the magnanimity of this huge church. Both the churches proclaims the history of great antiquity. The renovated new church is indeed a feast for the eyes. The newly built rosary park has become the major attraction for the pilgrims and the tourists as well.